Oh my it’s been an awfully long time and we have some catching up to do. I had to take a couple of months off to concentrate on my small business and my family. Since I’ve started blogging a lot has changed. A few years ago it was just my husband and I and now my With Love & Petals Family has grown from a family of 2 to a family of 4 and I couldn’t be any happier. These three have changed my life completely and I thank everyday for them. Speaking of a growing family, my baby brother got married in Baguio in the Philippines and I have a new sister! Unfortunately, I couldn’t be there for their special day because I was 8 .5 months pregnant, but I was there in spirit and forced my family to facetime me when they could :P. Their wedding was beautiful! Just look at this picture. It must have been even more beautiful in person. I still cannot believe that my not so little brother is married. Where did the time go? Now for my sisters wedding. Oh how I love weddings! My sister is getting married with her long time boyfriend, long time fiance (FINALLY). The dates are up in the air but it’s happening this year. It could be in 6 months or the end of the year. They both travel for work and it’s difficult to find time when they’re not traveling. Either way, I’m MOH and I have my work cut out for me. They’re shooting to get married at The Scripps Seaside Forum here in San Diego–a beautiful venue, but my focus is the 6 month timeline. I did some research online and yes, the timeline is aggressive, but as the timeline starts to spark out, it’s in line with your ideal one year engagement and that’s one thing you cannot change. The most difficult thing about planning a 6 month wedding I would have to say are the top three things that should be on every brides list. The wedding budget, finding a venue that can work with such a quick timeline and the same goes for the photographers, videographers and DJ. With how the wedding market works, it would be difficult to have all of those things fall in your favor, BUT IT’S NOT IMPOSSIBLE (my brother did it and their wedding turned out beautiful) so if you have the time, I would jump at the chance and be aggressive. I like it because it’s easy to follow and it covers all of the bases and more. Did you get married in 6 months or less? What was your timeline and what advice do you have for the brides-to-be? Share your story with us in the comment section below. We’d love to hear from you. 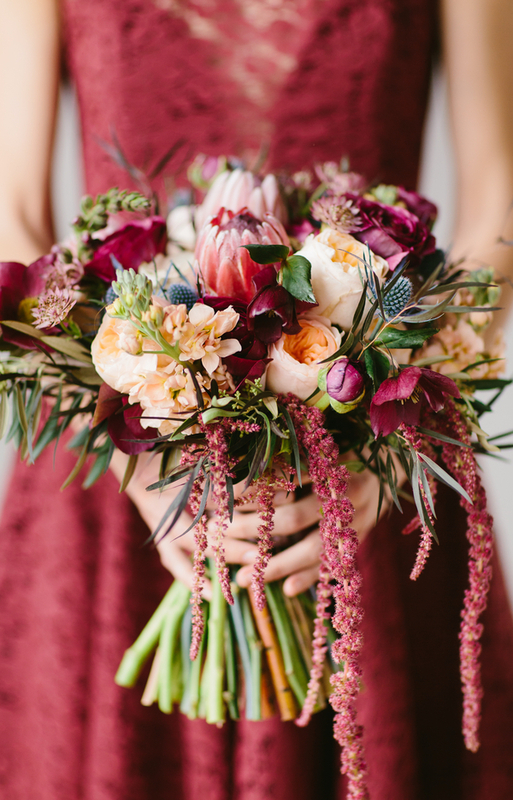 If you find yourself stuck in the cycle of pinterest overload, constantly changing your color scheme, and swooning over the bouquets that With Love and Petals makes, get ready for a truth bomb! Planning and styling a wedding is not an easy feat these days. It’s hard to know where to begin and even harder to know when to stop making midnight runs to your local craft store for yet another set of electric tealight candles. Being a bride is hard work that comes with not only incredible joy, but odd and long hours, big expenses, and at times overwhelming stress. We’re Thirty Day Dash, and we’re here to help! 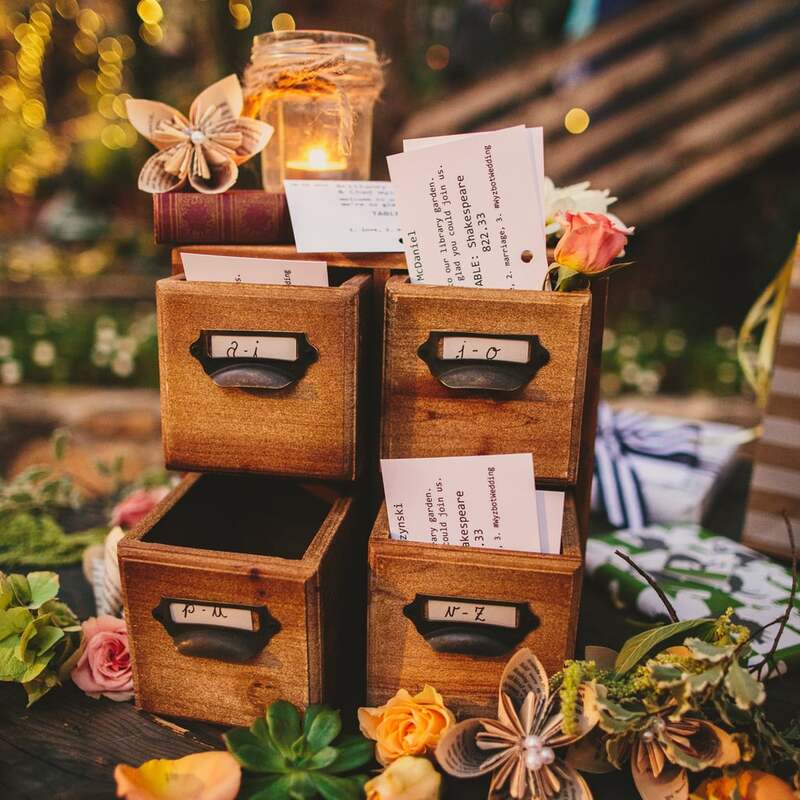 We at Thirty Day Dash offer creative and planning assistance in Austin and Dallas to the modern-day bride through day-­of decoration styling and breakdown, month-of coordination, custom guestbook creation, and home craft parties. We provide the creative expertise to help customize your wedding with personal touches and make your wedding day a true reflection of you and your significant other! Over the years we have found that the pressure to create a beautiful and unique wedding is higher than ever. 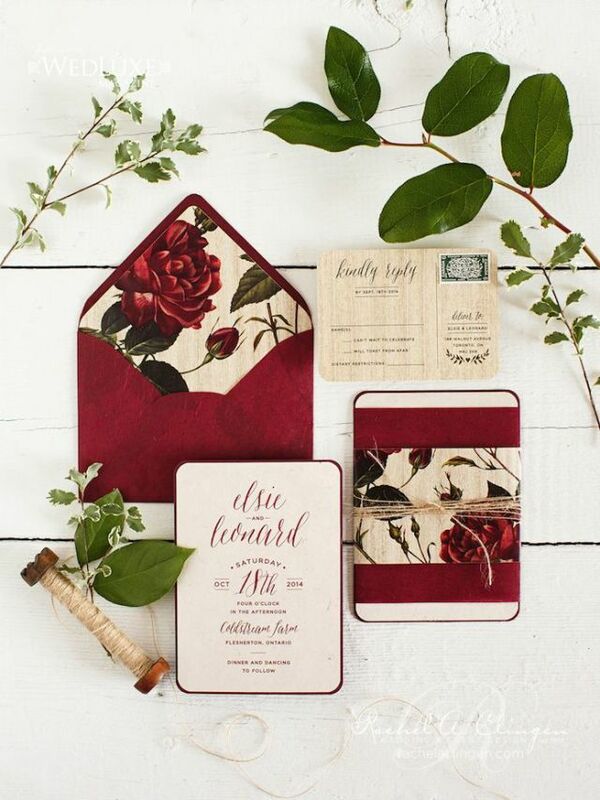 We are obsessed with With Love & Petals, because they provide such a unique service and product that is completely customizable, adds an incredible personal touch, and doubles as a beautiful wedding keepsake! 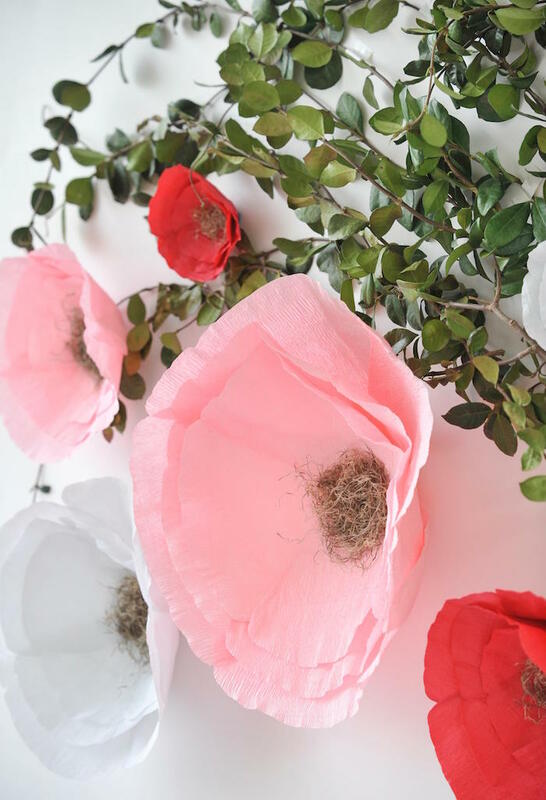 There are times to DIY and times to buy, and while there are a million paper flower tutorials out there (including a few that we have created on our blog) a bouquet is something that we recommend leaving to the pros, whether it’s real flowers or not. One of our past employees who DIY’d her own wedding recently even purchased a bouquet from With Love & Petals! 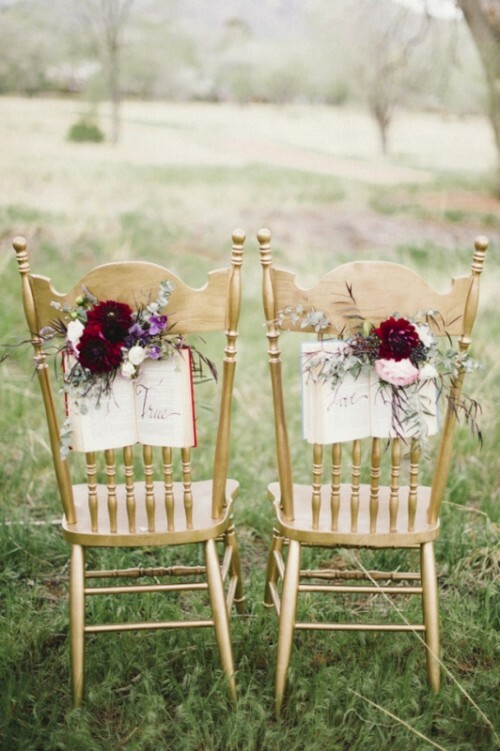 We’re excited to share our top five Wedding Planning tips with you! 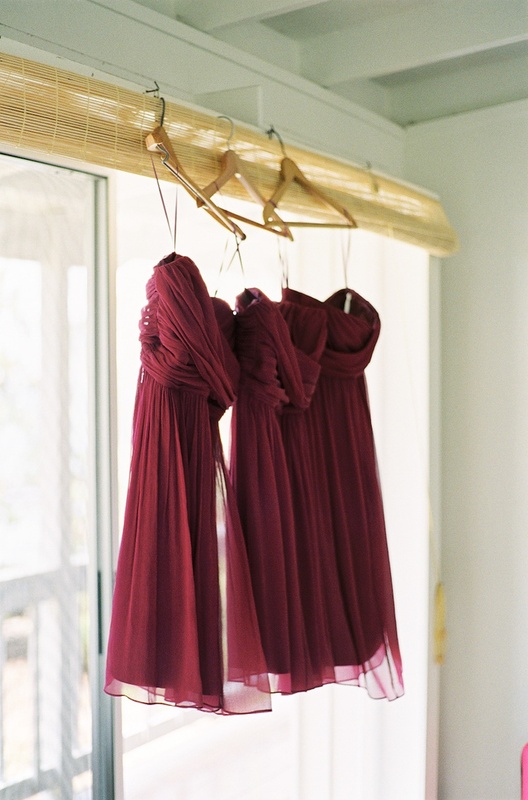 Stay Organized: There’s a lot involved in planning a wedding and there can be a lot to keep track of! If deadlines, budgets, contracts, seating charts, emails, and the like are not your thing, they make special planner notebooks for brides and grooms to help keep track of all of their vendor appointments, and wedding day details! Nothing beats a good set of google docs and sheets that you can share with any other friends and family members who want to be involved in the planning! Overestimate When it Comes to DIY: Overestimate the materials, time, patience, and help that you’re going to need to complete all of your DIY projects. The last thing that you want is that wedding budget falling out of line because you thought a project was going to be simpler to complete, or wouldn’t take as long, or wouldn’t require quite as many pinterest fails, or wouldn’t cause as much frustration. Plus, if you do better than expected you may even get to return some unopened supplies for a little refund! Use Table Numbers and Reserved Signs: If your guest count is over 50 people, and you’re not doing a plated meal, pop some table numbers and reserved signs out! Even if you don’t want formalized assigned seating, or even assigned tables, the more people you have, the crazier the line for food. Nothing makes your distant relatives crabbier than standing in a buffet line for 30 minutes waiting to get food. Table numbers give you a way to control that line by releasing only certain tables at a time, which allows the line to flow and not crowd the venue. Reserved signs are also super important if you plan on taking family photos after the ceremony because all of your other guests come into the reception and take their seats, while the most important people in the wedding party are still taking photos. They may end up having to sit next to random people they don’t know, split up, or worse, sit the farthest away from the couple. Check Yourself! 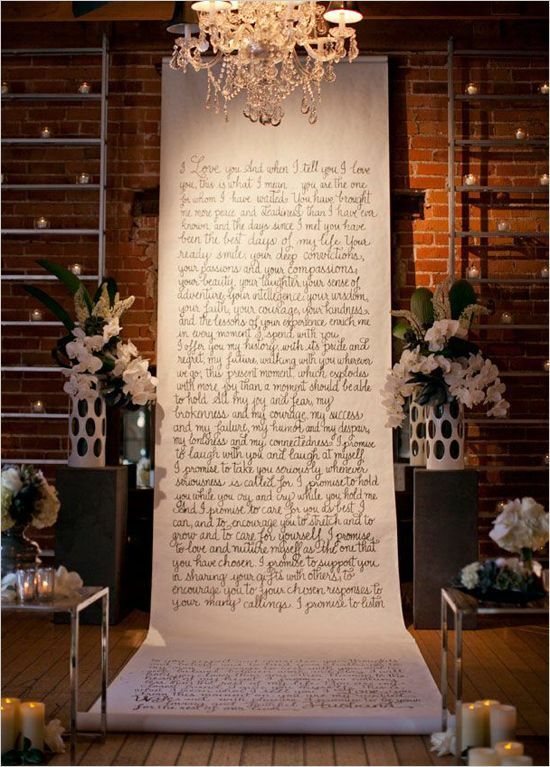 : Re-Read your wedding contracts to make sure you familiarize yourself with all of the policies and procedures of each company, and understand what exactly is included in each contract you signed a few weeks to a few years ago! You have a lot on your mind, and your brain probably needs a little refresher. Know when to ask for or hire help! : There is no shame is asking for a helping hand. Full Service wedding planners and month of coordinators exist for a reason. 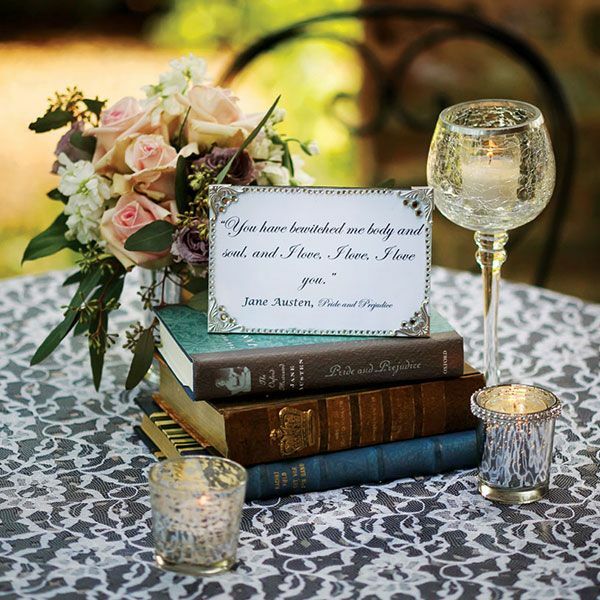 Wedding planning can be a full time job and it’s easy to get overwhelmed with everything on your to do list. 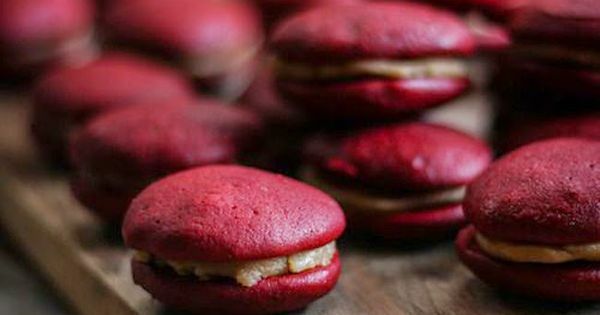 Friends and family members can be an incredible help, and provide great perspective, but we all know what happens when there are too many cooks in the kitchen… Event professionals and coordinators can provide an unbiased opinion and help wrangle all those pesky last minute details, and conflicting views from loved ones. A wedding coordinator works for YOU and ONLY YOU and has experience working with other vendors to fix any issues that may come up, and the knowledge of how to prevent many wedding day disasters as well! We are here to protect the investments you’ve made in your wedding day to ensure that everything you’ve spent months or years planning comes together seamlessly, without you having to lift a finger or stress about the details on the most important day of your life. 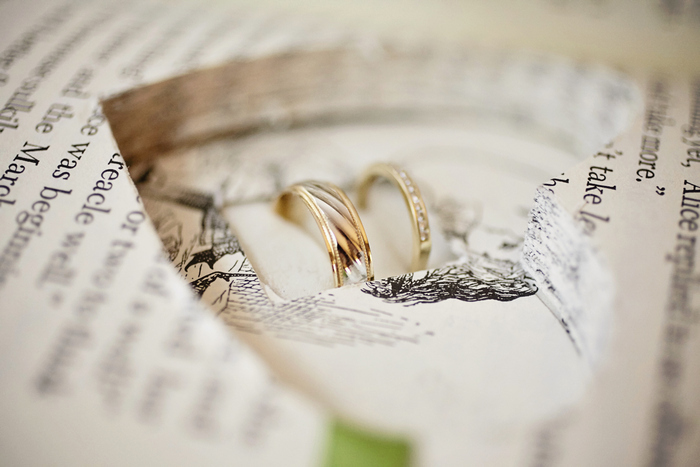 We allow you to focus on the celebration of your love and marriage. Can I just have one post about Bruno Mars’s song 24 Karat Magic! Right now, it’s my favorite song of all time and I think it has the right balance, of modern times and old school funk that it will get your wedding guests up out of the chair and dancing on the dance floor. Get those wallflowers off the walls, those “I don’t dance” non dancers up, and sleepy people up. It felt insanely crazy! I couldn’t believe we were finally married. What is love? Can love really be explained? As I see it, there are two ways to answer that without going into detail. There is the yes group and there is the no group. For me, love cannot be descried or explained because love should be experienced. You only truly know LOVE when you’ve experienced it. With love, you don’t need a lot of words-or any in fact. It speaks for itself. Love is easy, love is simple and love is FUN. I want to thank the lovely couple Billie & Billy for sharing their wedding day with us. Enjoy! About 4 or 5 years ago, we “met”. Although I (Billie Girl) don’t really remember. About three years later, life brought us back together and thankfully he remembered me! It was not “love at first sight”, but very quickly we fell in love. I have never been the outdoors-y type and Billy boy totally was! I decided I would bite the bullet one day and go on a hike with him. To both of our surprises (and to everyone else’s) I loved it! We hiked 7 miles our first trip. Very quickly after that, hiking became our thing. I had a feeling he was going to propose on a hike…so for about three months every time we hiked I would do my hair and make up. Little did I know he had a specific hike and day picked out already. July 3rd, 2015 was the day! We hiked Pine Mountain Trail at Lake Alatoona. On a typical day, that is one of the most beautiful views. On July 3rd, 2015 it was the complete opposite. The weather was terrible. It was pouring down rain and the wind was howling so loud we had to yell at each other. I ended up looking like a wet rat, but it didn’t matter at all. I could not have been more excited! It was perfectly imperfect. We had been planning a rather large (400+ people) June wedding. I had just graduated college and began working full-time when we got engaged, lots of life change happening all at once. In September of that year, my uncle passed away. With life moving so quickly, wedding planning became terribly stressful and quite the touchy subject. I cried over it a lot. I began toying with the idea of a more intimate/private wedding. One day, it all spilled out. I told Billy Boy what I had been thinking about – moving the wedding up 6 months, making it much more private, and a lot more quirky! He thought the idea was awesome. We decided to take just our families to the mountains 2 days after Christmas to get married. We got married at 9:30 in the morning with an intimate ceremony. Then moved on to brunch! We had a waffle cake and a cinnamon roll pie. Who wouldn’t love THAT?! We had all of our guests bring Ugly Christmas Sweaters to wear to the reception. It was perfect. When I was standing on the other side of the door waiting to walk out, I was freaking out! I could not believe it was finally time. When the door opened, I was just ready to get down there to him! I am glad that I was able to focus on it being OUR day, instead of worrying about a million other people. We were able to make it everything we wanted it to be. My grandma was our flower girl. His nephew carried the cutest sign. We got to dance to our favorite songs and eat WAFFLE cake!! Getting married was the one of the best days of my life. It was everything I wanted it to be. Billie & Billy, seeing the both of you on your wedding day just lets me know that life has even more wonderful things in store for you than the happiness that your found that day. May everyday be beautiful and happy for you as you share the rest of your lives together. And our Ivory Rose Book Page Wrist Corsages for their special guests. It’s been a little bit over a year since these two beautiful souls got married. Let’s go down memory lane and go back to the day their lives changed and forever began. 1. Tell us about all about it. Your relationship, proposal and wedding. How did you know you found the love of your life, how did the proposal happen and were you surprised? We were set up on a blind date in college, by a mutual friend, and having never been on a blind date before, both of us were quite hesitant about going. However, after meeting, it was like we had known each other forever. We clicked instantly; we challenged each other and we made each other better people. Fast forward two years: We were on vacation in Destin, FL and took a night-time stroll along the white sandy beaches. It was our favorite place in the world. It was there that he got down on one knee and proposed. Fast forward three years after the engagement (to the day, actually) and we were saying our vows. How do you know when you’ve found “the one”? When you’ve found your best zombie apocalypse partner, that’s when you know. 2. 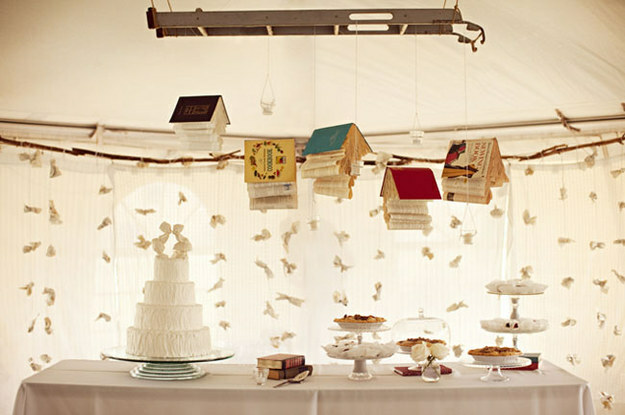 Tell us about your favorite wedding details or anything that made your day that much more special. 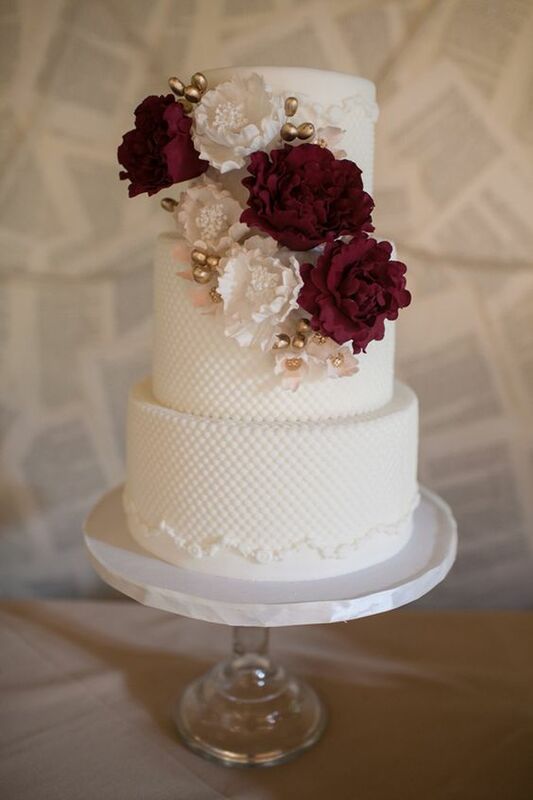 All of the personal touches that went into our wedding made everything so special. 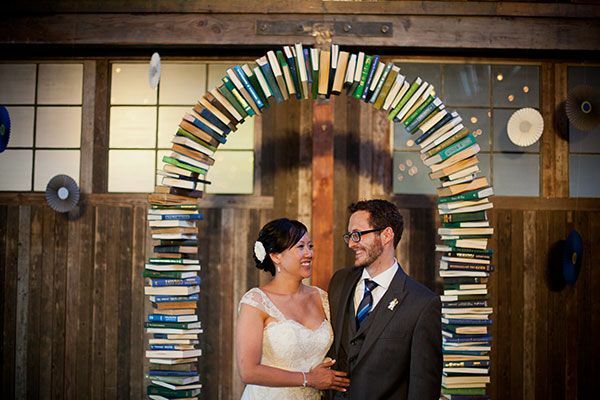 We are both avid readers, so naturally, we had a literary themed wedding. 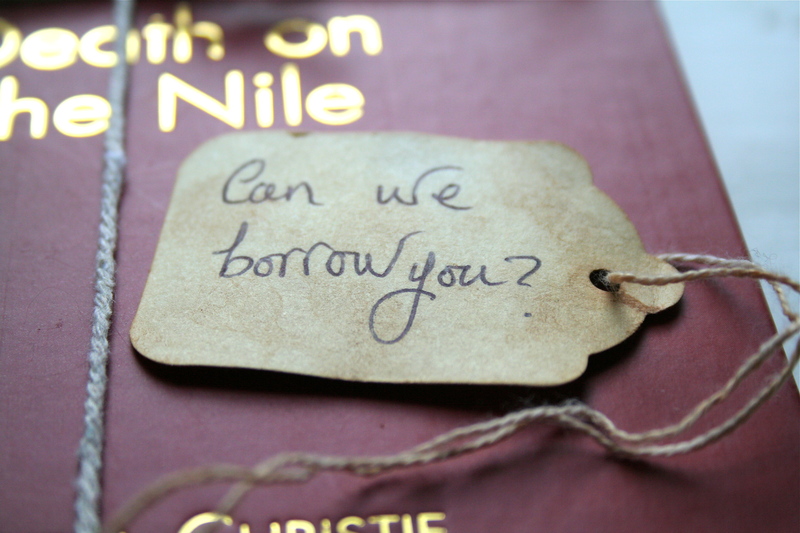 Rather than table numbers, we used our favorite books, and our programs were styled like library check-out cards. We also are self-proclaimed “nerds”, so we made sure to include lots of hidden gems, as well. For example, our cake toppers were miniatures of us in our Renaissance Faire costumes, the handles of our cake cutters were sonic screwdrivers from Doctor Who, my garter had a D20 die dangling from the lace and his cuff links were of R2-D2. 3. 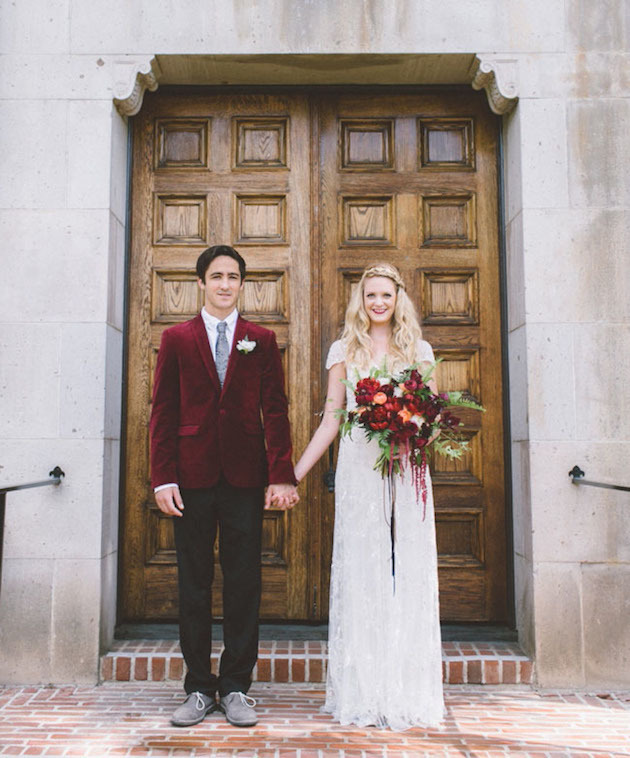 How did it feel like to walk down the aisle and see your future husband on the other end? Nothing can prepare you for the overwhelming joy that you feel when you are surrounded by your most cherished loved-ones and see your best friend at the end of the aisle. When I saw the tears in his eyes, there was no more holding back – the water-works were in full force! 4. 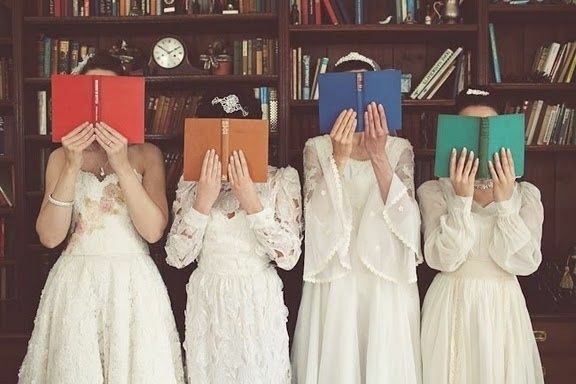 What is your favorite memory from your wedding? Our photographers were amazing and throughout the reception they took us outside of the venue to take quick photos in the sunset and to have a moment of escape from the festivities. The opportunity to detach ourselves from all of the noise was actually truly amazing; I recommend finding an excuse or two to separate yourselves, for at least just a few minutes, during the reception. The entire day goes by in an instant, so take a moment for just the two of you: look at everything you put together, soak in all of the beautiful details, look at each other, soak in each other’s beautiful details. 5. While marriage can redefine who you are to the outside world, it also affects who you are on the inside. How did being married transform you? Whether we are biking, playing Dungeons & Dragons with friends or sitting at home with our fur-baby, eating take-out Chinese food and watching re-runs on Netflix, everything becomes an adventure. He’s my best friend, my life partner, my co-pilot…it feels really awesome to have made this commitment to one-another. 6. What is the best thing about being married? The multi-car insurance discount! Kidding, I swear! The ability to both lean on each other through the tough days and celebrate the amazing ones together is incredible. Simply being able to share this crazy life adventure with your best friend is the most sensational experience. 7. How did you feel when you called your significant other “Husband” or “Wife” for the first time? It was actually the most strange thing, all I could think was, “Heck yeah – Achievement Unlocked!” Hearing him refer to me as “his wife” in conversation, well, swoon… In all honesty, it felt completely natural. Being surrounded by our favorite things and our favorite people made for the most amazing atmosphere. If I can give any advice to the brides/grooms out there, it is to not take everything seriously in the planning process. Have fun. 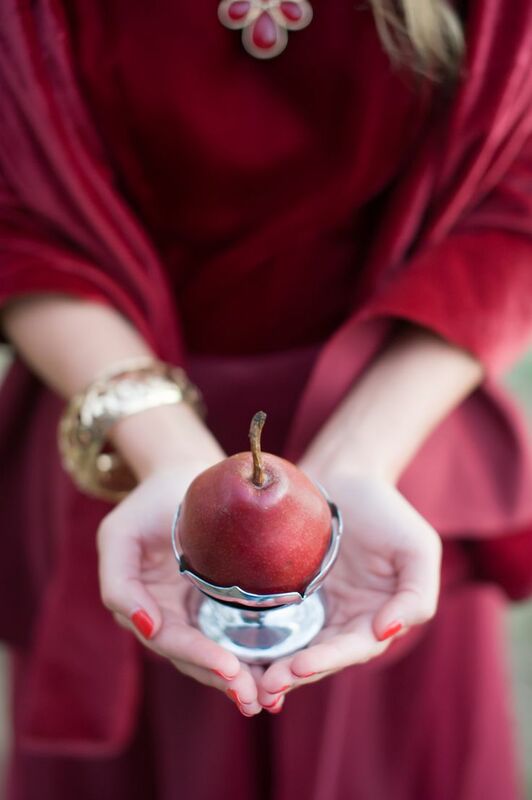 Let your passions inspire you and never feel confined by the traditional wedding standards. Not a fan of white? Go with a bold colored outfit. Slow, sappy songs aren’t your thing? Rock out to an upbeat first dance. Who cares? It is your day, so let your love and personalities shine through in each detail, whatever that means to you. On the day of your wedding, breathe. Inhale. Exhale. Repeat. Everything will not go perfectly as planned, but know that it will be perfect all of the same. Heck, my veil fell off during the ceremony! Shrug off any mishaps and I promise you will laugh about them later. Remind yourself of all of the wonderful reasons why you are making your vows and strive for a marriage more beautiful than your wedding. Congratulations Maria & Dalton on celebrating a year of marriage! I wish you a lifetime of happiness and that your love story be as magical and charming as in fairy tales! All other items were made/facilitated by the bride. In this generation, apps are on the rise. Photo apps, Social Media Apps, Money Managing Apps and Wedding Apps are out there to help you be entertained and organized. There are so many wedding apps out there, so how do you know which one is the best one? Our friend Isa from Culture Coverage has the inside scoop on the best wedding apps that are actually helpful – and who knows, maybe you can come up with some party rental business ideas to fill the gaps. So sit back, and continue reading. You’ll definitely find one that will fit your needs. I would like to thank With Love and Petals for sharing this article on their website. This site is full of wonderful ideas that help ensure your wedding planning is a journey that’s as special as your wedding day itself. If you’re just getting started with your planning, have a look at their helpful article about color palettes. 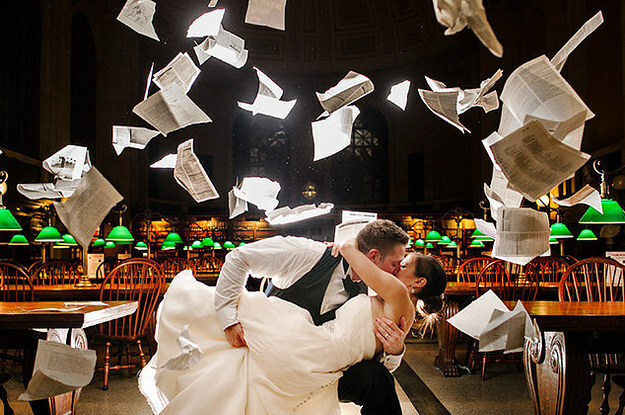 Planning your wedding can be exciting and fun, but also quite stressful. Thankfully, technology can make the whole process much easier. Gone are the days of messy organizers, misplaced checklists and countless scraps of paper. Now you can plan your entire wedding using apps that walk you through the whole process and provide many handy features such as budget tools and RSVP tracking. Don’t worry if you’ve got a tight budget because there are some excellent free wedding apps available too. There are many different apps available, so it may be hard to choose the right one, but the following wedding apps are all very useful and will help you ensure your big day is a dream come true. 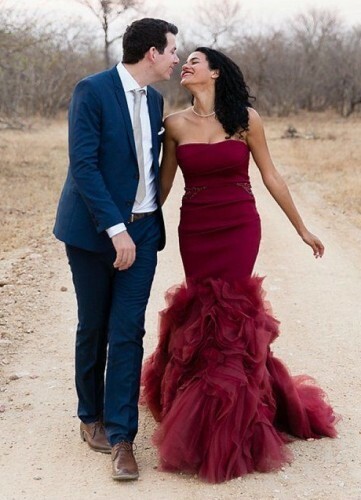 Appy Couple is a very versatile app that allows you to design your own wedding website where you can share your engagement and wedding story with your loved ones. You can design your site either through the app or on a computer, and it has some really gorgeous designs to choose from, so you can match it to your overall wedding style. The app allows you to manage your guest list and RSVPs, keep in touch with your guests via group messaging and upload and view photographs. While it isn’t free, Appy Couple is by far the most customizable of the wedding apps, so it’s definitely worth the cost to make your wedding planning and day run smoothly. If your budget is a bit too tight to allow you to buy wedding apps, you can always download The Knot Wedding Planner app free for both Android and iOS. This app has useful wedding planning features such as wedding ideas, checklists for each month and wedding budgeting. You can sync your account to The Knot’s website to design your own wedding website and get access other great features such as guest lists and RSVP tracking. The website also has lots of useful ideas for décor, dresses, stationery and accessories. It even provides some much-needed information about wedding etiquette. Another free wedding app to consider is Wedding Party. It doesn’t have as many features as some of the other wedding apps, but it’s a good choice if you’d like to keep things simple. You can create your own wedding website that syncs with the app, and the app allows you to send group messages to everyone or just to certain groups, such as bridesmaids. You can create photo albums for your engagement pictures and the days leading up to your wedding, add information about your ceremony and reception and add links to other sites such as gift your registries. If you do decide to create a wedding website with any app or site, you’ll be uploading some private information such as your guests’ contact details, so there are a few things to keep in mind. First, use decent passwords and keep them private. Second, don’t upload your banking information unless you need to pay for your website or services. And, third, it’s a good idea to use some extra software for protection, such as anti-virus software and a VPN to protect your privacy. Single store wedding registries can be useful, but they’re very restrictive. Luckily, Zola Wedding Registry is a great free app for iOS that allows for a lot more flexibility. It lets you scan barcodes on your phone, add items from any website and add cash funds for your honeymoon or other fun experiences or services. It also allows you to turn on group gifting so that your guests can split the costs of bigger items, such as furniture. This way you’re more likely to get gifts you really want and need. If you’ve been imagining your perfect wedding since you were a child, there are sure to be a few things that you know you want for your wedding, and you’ll need to stay on top of your wedding budget to ensure you spend your money on the things that really matter to you. Wedding Budget Calculator is an app for iOS that will help you do just that. It isn’t free, but it keeps track of more than 50 different wedding expenses and keeps track of deposits and final payments. With all these useful features, you’ll find it much easier to stick to your budget. Alternatively, Our Wedding Planner is an app for Android that has many similar features to help you avoid overspending. If you’ve used any helpful wedding apps that aren’t on this list, tell us all about them in the comments section. About the Author: Isa is a technology blogger with a soft spot for romance and weddings. She hopes these wedding apps will make planning your special day a pleasure. 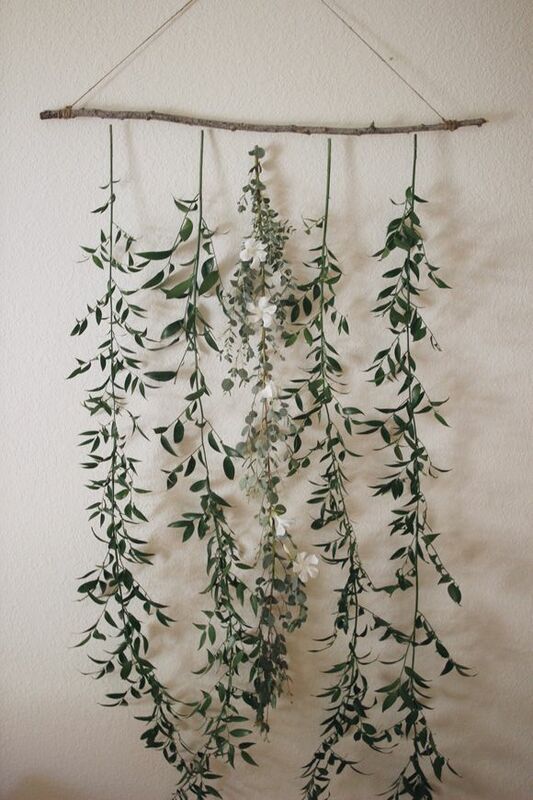 Not a lot of us can splurge on a flower backdrop just like Kim & Kanye, but you can craft them to last forever. 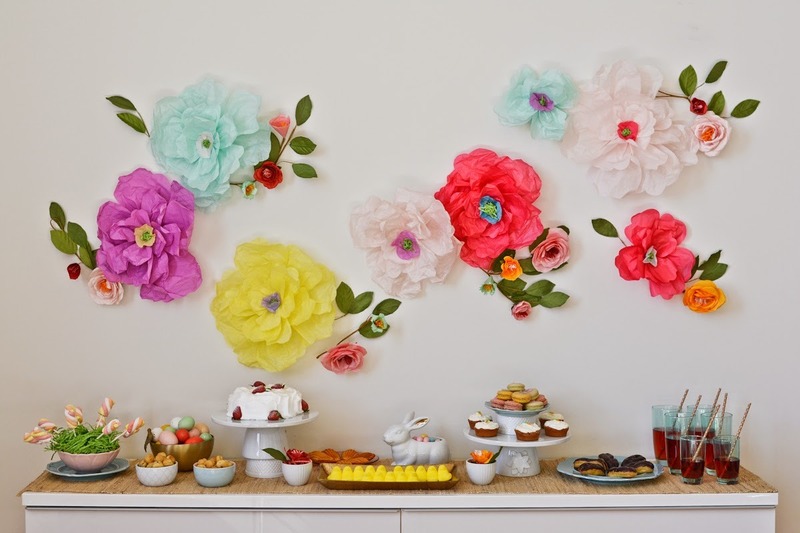 I’ve always wanted to make a paper flower wall and wished that I made one for my wedding day (there’s always the vow renewal right ladies?) because they’re just so BEAUTIFUL! 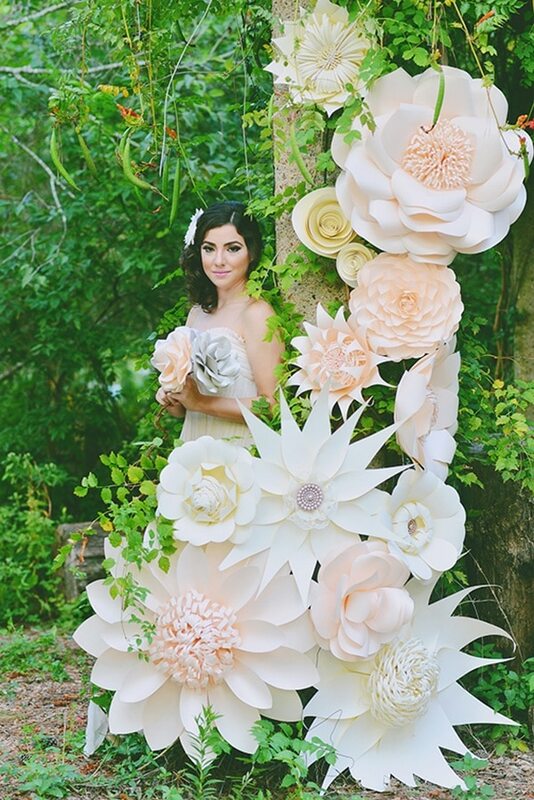 For those of you who are interested in paper flower walls, here a few inspiration photos that I love and wish to have. A tutorial you ask? 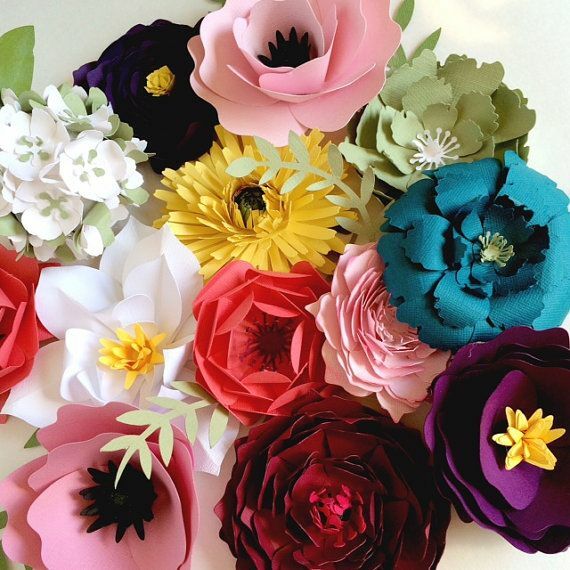 There are a ton of great paper flower tutorials out there. It’s just a matter of finding the materials you are using (card stock or crepe paper) and the type of flower you are looking to make. It takes a lot of practice and it will test your patience, but stick with it and you’ll be making beautiful things in no time. There is one thing out there that may not be mentioned in your paper flower tutorial, and that is how to hang those beautiful creations. I searched high and low for the best and found one just for you. One of our paper flower crushes Paper Flora has a detailed tutorial on how to hang those giant beauties. You can find it by clicking the link here. 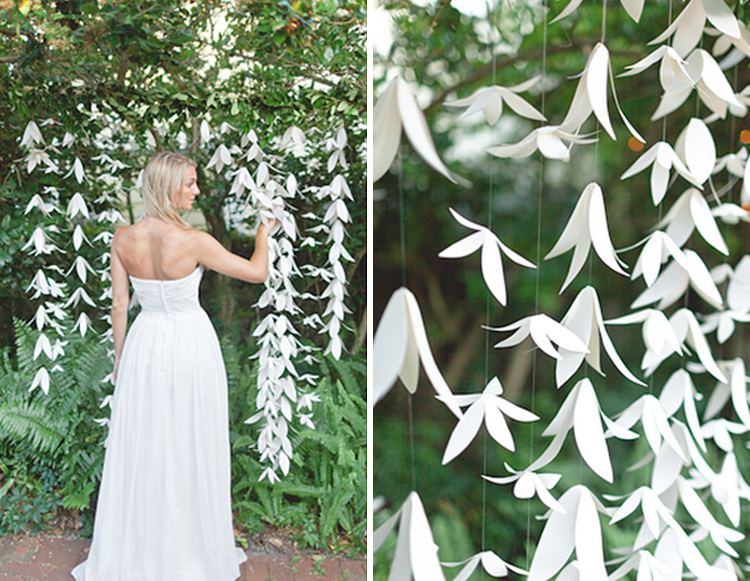 It’s super easy to follow and their paper flower are to die for. I cannot wait to see your beautiful creations! Lots of positive paper flower making vibes going your way.